Shirts With Random Triangles: Property in Pittsburgh owned by Mississippi St. cornerbacks coach Deshea Townsend was scene of drug raid. Property in Pittsburgh owned by Mississippi St. cornerbacks coach Deshea Townsend was scene of drug raid. Deshea Townsend. Photo via clarkesdaleinfo.com. A house owned by Mississippi State cornerbacks coach Deshea Townsend was the scene of a raid by Pittsburgh police on Sunday night. Members of the DEA were also reportedly involved with the raid. Police arrested two men at the house, and seized 1,500 bricks of heroin, along with $100,00 worth of cash and jewelry. Firearms, luxury vehicles, Cuban cigars, and a live chicken were also reported to have been seized in the raid. Townsend, a former Pittsburgh Steelers cornerback, was not at the scene, and is not implicated in any wrongdoing. A spokesman for Mississippi State told The Jackson Clarion-Ledger that Townsend rents the Pittsburgh property out to tenants. 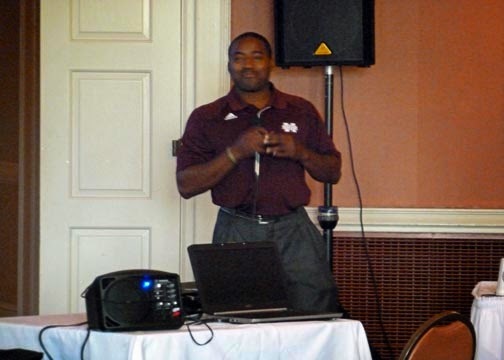 Townsend has been a member of Mississippi State head coach Dan Mullin's coaching staff since 2013.